Reader Angie updated us with an even better price on this!! 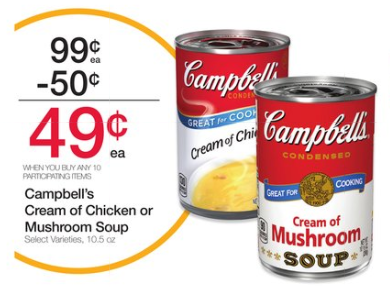 When you buy select Campbell’s Condensed soups as part of the Fred Meyer mega sale and pair it up with a coupon, they will be as low as $.29 a can! That’s down from the $1.39 regular price on them! (Don’t forget to mix and match the items from the promo so you have 10 participating items to get the sale pricing.) Thanks for the head’s up on the new pricing Angie! Final Price: As Low As $.29 each WYB 4 as part of the mega sale promo!